And then I saw this gorgeous card that the fabu Ms. Amber Hight created for the Verve Diva Dare and I instantly said: "aaawwwwwww - how cute is that??!" and I wanted to try to make a Hight creation too!!! But, as I sat down to CASE Amber's gorgeous card, I just couldn't get mine to be "Amber-pretty" - so after wrestling with different layouts (phew! am I tired!) I settled on something simple. Accessories: Heart punch from MS, ribbon from stash, liquid pearls, spellbinders nesties, corner chomper, twine, safety pin and dimensionals. I have to say that it was so much fun to make this card and I totally dedicate this card to Ms. Awesome Amber! Check out all the happenings going on over at the Verve Blog where this month the Diva Dare theme is Baby Love - and you have a chance to win some yummy Verve goodness!!! 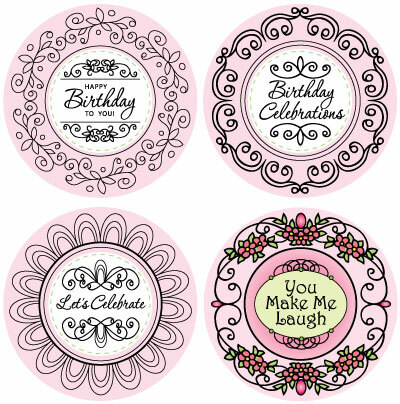 Tonight, we are showing samples from a super sweet birthday stamp set from JustRite Stamps called: Birthday Celebrations. 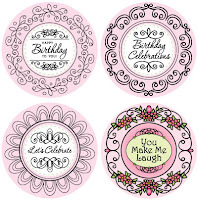 This stamp set fits the 3-1/4" stampers and has 4 extra wide borders and comes with four 2" centers ( these extra wide borders are designed to be interchangeable with all of the 2" centers!). I loved the border with the flower-y looking petals, so I stamped that twice on the pink and yellow dp from DeLovely and cut them out and layered them ontop of each other. 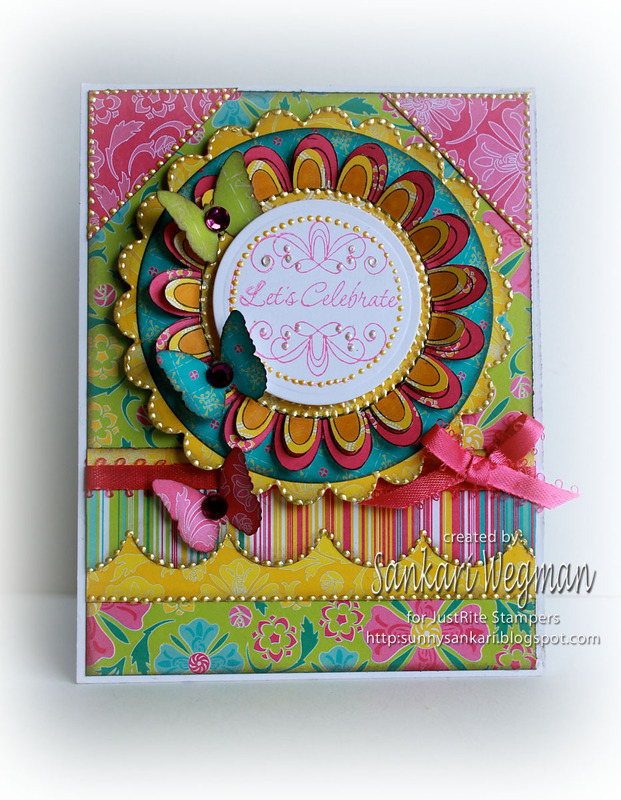 For the center sentiment I stamped "Let's Celebrate" and cut it out with my nesties and popped it up onto the center. I layered the little flower ontop the blue DP and yellow scallops that I cut out with my nesties. I love the sweet little swirls alongside the sentiment and dotted it up with some liquid pearls. Accessories: scalloped and circle nesties, EK success scalloped punch, liquid pearls, butterfly punch from MS, ribbon from stash, bling and dimensionals. Thanks so much for stopping y m blog today! Hope that you are having a fabulous day! 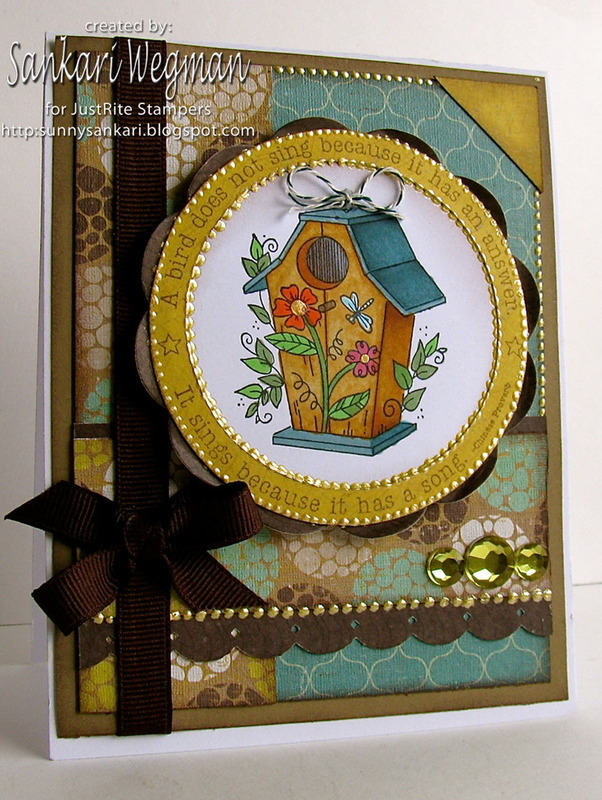 This evening JustRite stamps is showing samples from one of their new ribbed stamps: 3 1/4" Birdhouses (Interlocking). 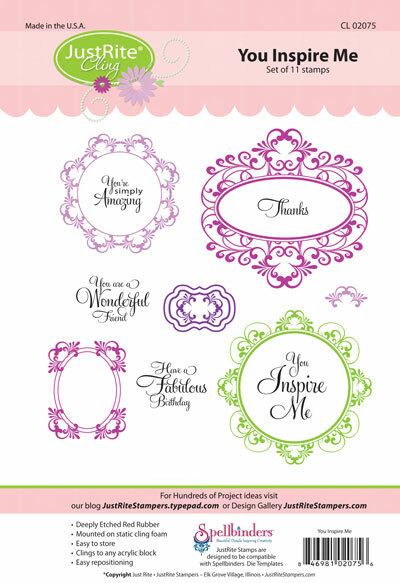 This stamp set features three sweet images of birdhouses and lovely circular sentiments. My favorite was this image of the stamp set that I colored with copics and adorned with some twine at the top and a dot of liquid pearls in the centers of the flowers. I chose one of my favorite sentiment: "A bird does not sing because it has an answer, It sings because it has a song." I love that sweet sentiment. ***** Also a huge head's up! Thanks so much for stopping in today!and I hope you will stop by tomorrow for the preview of JustRite's new Birthday Celebrations stamp set! 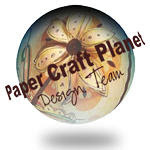 I had a chance this morning to play - just for fun - in my craft area :) I love when that happens and I have to say that it was such a great form of therapy! It was fun to add some sparkle to the hearts and pop the birds in the nest on top of the wreath. I added a little trio of buttons to the bottom and a line of the ribbon on the edges of the image panel. I popped up the center of the frame and finished it off with some sponging and liquid pearls. 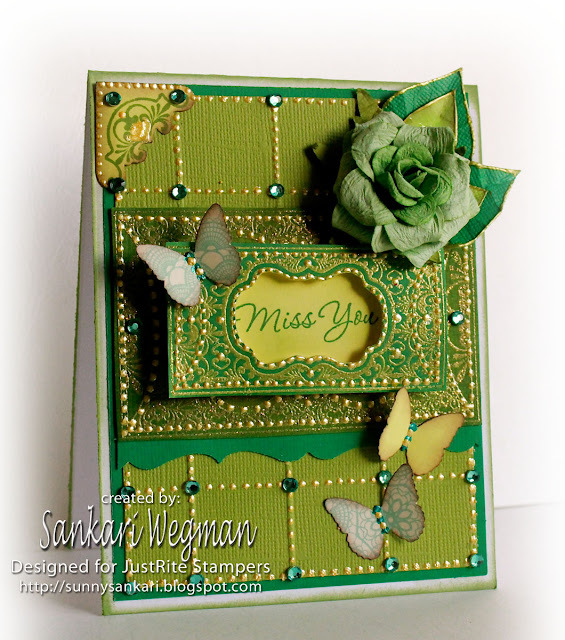 It was so much fun to make this card - and I love getting some stamping in the early hours of the morning! what a great way to start the day :) Well, I am off to an exciting day filled with laundry, dishes and vacuuming ( I know I know, its so exciting around here)! Hope that you have a wonderful rest of your weekend and a great start to your week tomorrow! I am very grateful that it is saturday - there is nothing like being able to sleep in bed under the covers when you are feeling sick and everything outside is so very cold and gray - ugh. 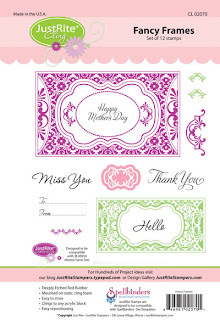 I have to admit that I am dreading monday - hoping that all this congestion is gone by then and my head feels less like cotton balls :) There is nothing like a little stamping to clear the head ;) I had a chance to play along with one of the new gorgeous JustRite cling stamps called: You Inspire Me. 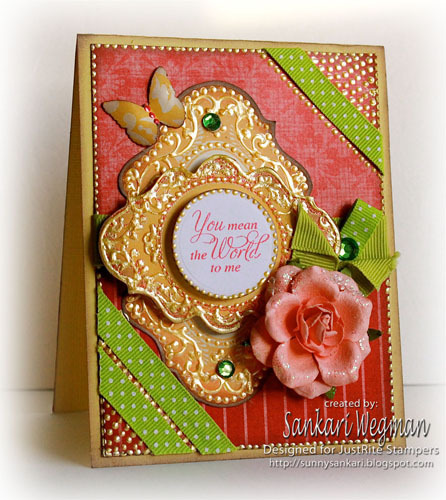 I love all the frames that fill this stamp set and the sentiments are so very sweet and lovely. I wanted to make a card for a dear friend of mine and wanted her to know how much I appreciate her friendship over almost 20 years! Its so strange to write that - time does fly by and I remember thinking 20 years ago that the age I am now at present - was so very old (ha!) now I remember how even though I thought that I knew so much back then, I realize that I really didn't know very much at all :) Anyhow, I wanted to make my friend a special card and I feel so grateful that even across this span of years we are connected. Accessories: EK success scallop punch, bling from Bazzill, nestabilities, ribbon from May Arts, red tacky tape, dimensionals and liquid pearls. I traced over the frame over with some liquid pearls and then embellished a few scallop edges with them as well. 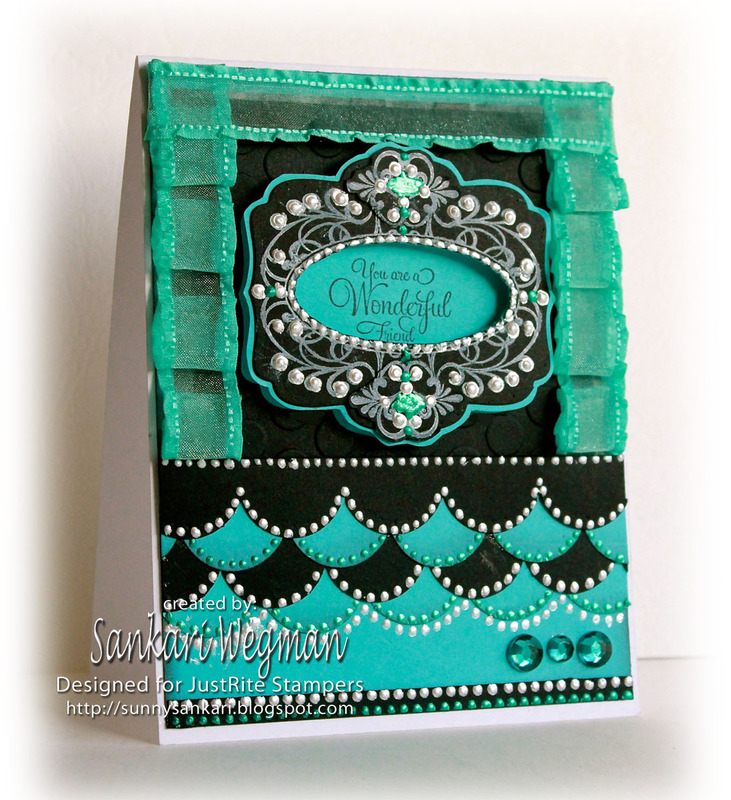 I was going to add another accent color, but kind of liked the black/white and turquoise feel, so I added a little ruffled edging to the sides of the card and some bling on the bottom. Thanks so much for stopping by today! Hope your weekend is happy and sunny! Today is Friday and that means that there is a brand new Viva La Verve Sketch happenin! And I am so excited to be hosting the last sketch for January (make sure to check out all the Verve sketches for January here!) and when I drew up the sketch - I had one person in mind - dearest Marisa who is definitely NOT a fan of any panels that tilt! The last time I did a VLV sketch - it had a tilted panel and I think I could hear her groan when she saw it :D so when I was drawing the sketch for this week's sketch challenge - I tried to make one without a tilted panel in honor of you dearest Marisa :)! Of course if you want to tilt a panel - please feel free to tilt away - all tilting welcome! Stamps: the heart is from the Love Notes stamp set, the paper pieced kites are from To The Moon stamp set, the sentiment "Be Mine" is from the Swirling Hearts stamp set, Emery (Plain Jane) stamp image from Verve Stamps. Accessories: liquid pearls, EK success scallop punch, heart punch from MS, bling from stash, dimensionals, copics, ribbon from Emma's Papiere, nesties, baker's twine and red tacky tape. I loved making this card - I think the best part of making it was having some time to myself last night - the kids were in bed, the house was quiet and all was good! I love those quiet moments :) I love this little Emery guy - and can't wait to make some more cards with him - he is just sooo very sweet! 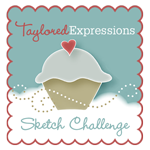 Hope you will play along with the sketch challenge! 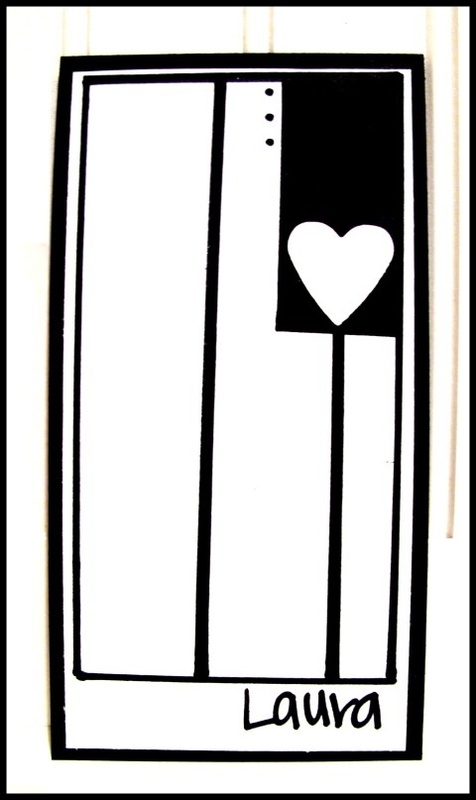 One person who completes all 4 of the VLV sketch challenges this month will win the entire Verve Release - you can check out the VLV page for more details on how to win lots of yummy Verve!!! 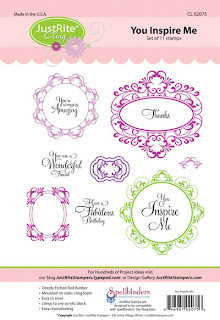 I used one of the brand new cling stamps from JustRite stamps called Fancy Frames that is seriously gorgeous - I truly love these frames and how you can mix and match the sweet sentiments in them (they are also compatible with the new Spellbinders that will be released soon!). I stamped and and embossed both the frames in the stamp set with gold EP and then sponged ink onto the frames after using a heating it. I popped up the smaller frame with the sentiment: Miss You onto the larger frame and finished the edges with some liquid pearls. Accessories: butterfly punch from MS, bling from stash, flower from Prima, border punch from EK success, dimensionals, gold EP and liquid pearls. Please check out the JustRite stamps store for some wonderful sales that are going on!! I loved making this card for my friend Carolina - (and if you are reading this Carolina - know that you were sooo missed this weekend and we can't wait to see you soon! xoxo!) 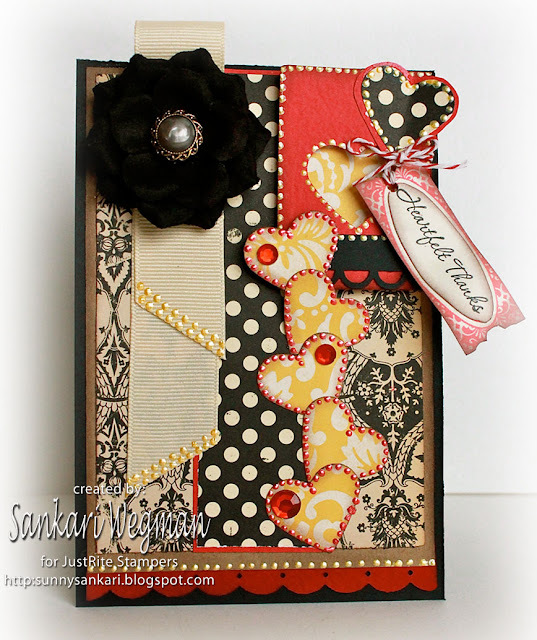 It was fun to create a monochromatic card and I want to create more of these! Accessories: heart epoxy stickers and ribbon from stash, Take Note Die -3, dimensionals, EK success punch, white opal liquid pearls and clear spica glitter. 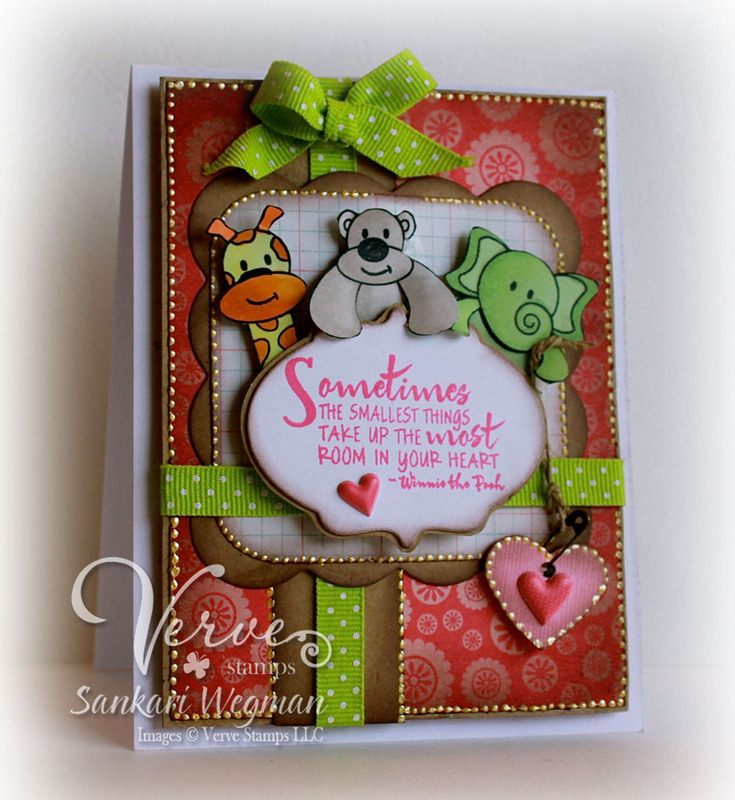 I loved stamping these cute elephants! All of the animals in love stamps are so cute - you can check them out here. 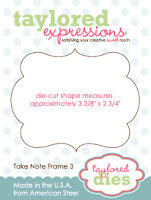 Also check out THIS POST on Taylor's blog for details on some special products over at Taylored Expressions that are on a Special VALENTINE's SALE from now through the 23rd of January to get you into the Valentine's Day crafting mood!! There are so many amazing crafters who are playing along with this month's Blast from the Past - so hop on over with me and check them all out and if you leave a comment during the blog hop - you could AND A PRIZE! 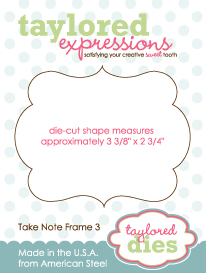 We will be drawing one random hopper to receive a FREE Taylored Expressions set of their own - and we'll also be choosing another creation to be featured in an upcoming TE newsletter. 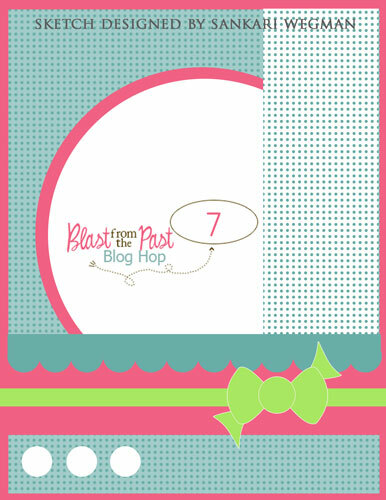 Stay tuned to Taylor's blog for more details about the next Blast From the Past! 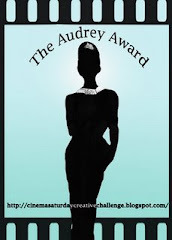 I am excited to be hosting Day 3 of the Diva Dare Challenge over at the Verve Blog today. Every there will be a different theme to and this month the theme is to create a card, project, layout with the theme Baby Love! 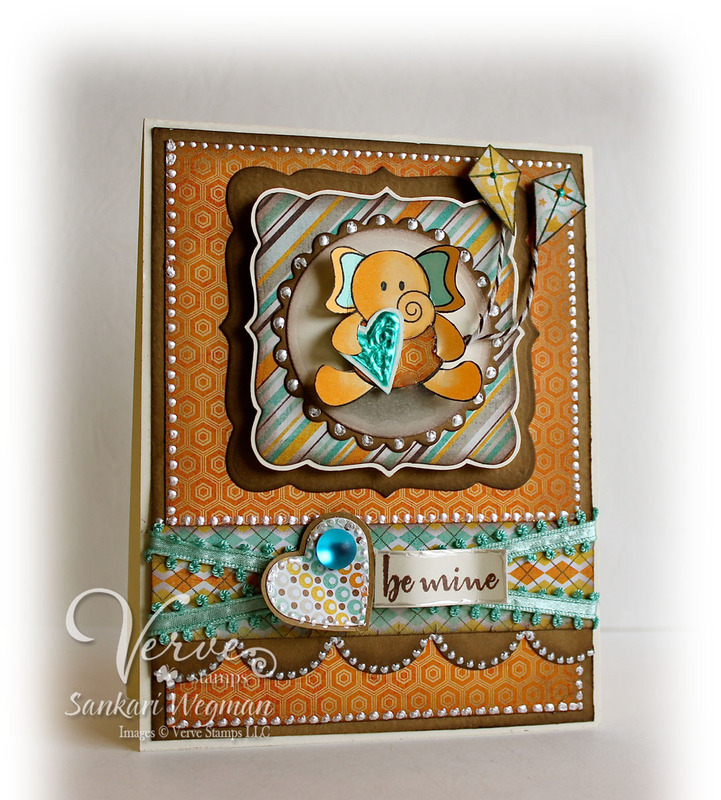 The baby part could be for a new little someone...or a special someone! For the onesie, used yummo Pixilicious papers and cut out the onesie pattern and outlined it with a bit of liquid pearls and used the little teddy bear with the window frame technique (Jackie and Amy - I totally love how you did the little guy in the window and I couldn't wait to "window" him too :D I punched out a little heart for him to hold and popped up the sentiment "welcome" on the side. Accessories: MS heart punch, bling, eyelets, EK sucess punch, dimensionals and button from stash. 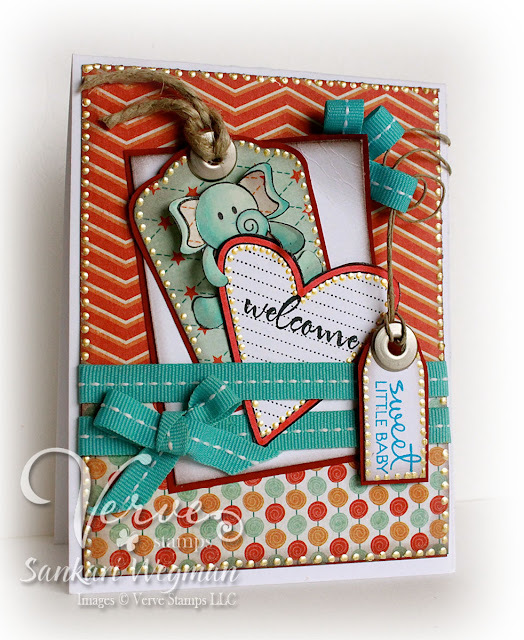 It was so much fun to create this for my friend and love this month's Baby Love theme!!! If you play along with this month's theme - you could win a LOT of Verve goodies !! Please stop by the Verve blog today for more details on how to win - and how to play along! Happy Friday! Every Friday there is a Viva La Verve Sketch that will be hosted by a different Verve Diva and today the loveliest Tosh is hosting the VLV challenge with this lovely sketch! I love tilted panels (as some of you know ;) and I couldn't wait to play along :) One of my sweet friends just had a little baby boy this week (yay!) and I loved getting peeks of his sweet cheeks on the pictures that they sent and couldn't wait to make a special card for them! 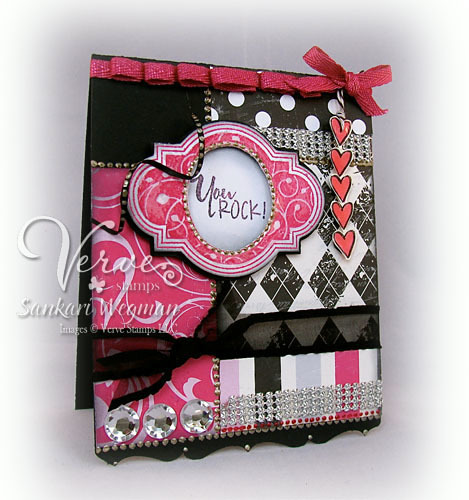 One lucky person can win the ENTIRE January release from Verve stamps!!! All you have to do is to complete all 4 Verve Sketches in January - check out all the details here; Viva La Verve (January).